Named for its original owner, Walt’s Hitching Post was founded by Walt Ballanger and his wife Mary in 1942, establishing signature items no greater than the legendary smoke house ribs. In 1958, Ballanger sold the restaurant to his neighbor Bill Melton, a young bartender at the White Horse Inn. Bill Melton kept the name in Ballanger’s honor. The “Hitching Post” got its name from cast-iron posts where customers could tie up their horses. 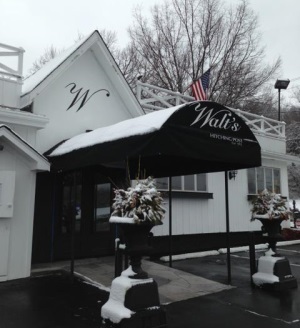 Walt’s has undergone at least seven expansions since Melton took over the little restaurant in 1958 and ran it successfully for 50 years until his passing in 2008. Long time diners Bronson Trebbi and Donny Arnsperger purchased Walt’s from the Melton Trust in September 2012. As new “caretakers” of the establishment, they are committed to continuing its legacy by breathing new life into the restaurant, while being careful to uphold its identity. Since its inception, this historic relic has served a wide range of prominent folks from politicians to actors and more, including visits from legendary Adolph Rupp, the greatest coach in college basketball history. Folks in these parts are very familiar with the delicious ribs complemented by Walt’s signature secret sauce. Other staple items include the Salted Rye Bread, Tomato Garlic Dressing, and chicken livers, along with the addition of a new lineup of mouth-watering steaks. “It’s an icon and we wanted to bring it back,” says Arnsperger. During the restoration in 2012, the new owners preserved many existing fixtures and furnishings to preserve the rich history surrounding the property. This is best exemplified by the exposed log wall in the main dining room, showcasing the original log cabin that was used as a hunting lodge for Western & Southern executives in the early 1900s before it became Walt’s in 1942. For decades, Walt’s has been adorned with pictures of thoroughbreds, the prized possessions of the late Bill Melton, who also owned a horse farm and raced champion breeds. The new owners have expanded on the horse theme in an innovative way, paying tribute to the sport that the nation has grown to fondly identify with Kentucky.